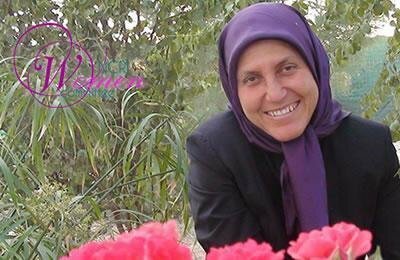 I am Shirin Rahimi, a 48-year old from Qasr-e-Shirin, a town in Kermanshah Province of Iran. The day I decided to join the Resistance, I was a 19-year-old young girl in search of change, perhaps because I grew up in a place where girls and women were subject to double oppression, societal pressures, and limitations. Where I grew up in Kurdistan, girls were often registered on their birth certificates either just as a surname or took the name of a male family member. They had no power to make decisions for their future lives. The tears, depression, and hardships of the women and girls that I witnessed always left me wondering if there is any way to bring about change. I remember when I was in fifth grade, my older brother, Faramarz, used to ask me to go buy newspapers and books for him. He used to study and debate with his friends at home, and I, who was very eager to do such things, used to stand in the corner and watch them. It was 1980 and I was about 11 years old when our family along with thousands of others were displaced by the Iran-Iraq war and after having lost all of our assets, we moved to Kermanshah. In 1983, Faramarz was arrested while he had gone shopping. He was a teacher at the time and had gone to the market to buy some materials for his students. Faramarz was taken to the dreaded Dizelabad Prison. Shortly after, his close friends, who had become family friends, were also arrested, many of whom were executed or tortured to death. My life took on a different turn and started to change drastically especially after Faramarz’s arrest. I insisted on placing myself on the list of permanent visitors to Faramarz. It was quite hard because the guards only allowed a limited number of relatives, but that didn’t stop me. I remember during the visits, Faramarz used to write with his finger on the glass separating us so that the officers could not understand our conversation and I used to respond back with gestures and signs. On one of our visits with my mother, we saw a guard who brought out a few bags and dumped them in a large trash bin outside the prison. When he left, my mother asked me to go look into the bin. In complete disbelief, I saw that the bags were full of the prisoners’ hand-crafted arts, paintings, poetry, and gifts that were made with great difficulty and effort. A booklet drew my attention. I opened it. On each page I found beautiful drawings. On one page there were bars depicting the jail. On another page, there were calligraphed poems, and on another, a bird which had been able to open the cage and escape. At the time, I did not realize that those were the belongings of prisoners and their gifts for their families, or the memoirs of executed prisoners that were being thrown to waste! In any case, it was the fruit of the freedom fighters who despite being behind bars, and yet full of hope, were relaying the message of Resistance and oath of victory! And I clearly heard and understood their message! I took the booklet to my mother, and I know that it remains with her to this day. Faramarz was eventually released by the late 1983, after which he joined the ranks of the warriors of the People’s Mojahedin Organization of Iran. As I grew up and became more aware of my surroundings and the misogynist laws which discriminated against my fellow country women and girls, these facts increasingly preoccupied me. I witnessed many situations in which they did not have the least choice even in the simplest and smallest matters. Without their consent, they were married off to men who were strangers or were a few times their age! These women had no right to work, choose a career, nor were they given the opportunity to study, and throughout their lives, they were always subdued and the object of others’ decisions. Hence, many cases of self-immolation and suicide. I felt an overwhelming and unsettling spirit seeking to overcome the status quo and breaking all of its laws. I would say to myself, I want to be a decision maker, to paint my life as a “woman” and choose who I want to be. Such aspirations and ambitions, along with the greater knowledge of the Resistance, brought me to a firm decision of joining the ranks of the Resistance. Finally, on August 11, 1989, after receiving my diploma, I managed to reconnect with the Resistance and bring myself to Ashraf, and to this day, for the past 29 years, I have experienced all the adversities, challenges, and achievements the Resistance has gone through. The days when I used to observe my older brother and his friends, I never thought that one day my name would be among Iran’s freedom fighters, but today I am very happy to have fulfilled that wish. Especially since here and in the Iranian Resistance, all of us women have chosen our paths and withstood and persisted through all the hardship, so that eventually, in the near future, we can overthrow the dictatorship of our country with our brothers and sisters. And I, with my other sisters, have vowed to bring a smile of victory to their lips.